U.S. Senator Bob Corker has eviscerated President Donald Trump after a spat between the two Republicans erupted on twitter. “It’s a sad place, from my perspective, for a nation and I think the worst of it is going to be just the whole debasing, if you will, of our nation. I think that will be the contribution that hurts our nation most,” Corker told reporters on Capitol Hill. 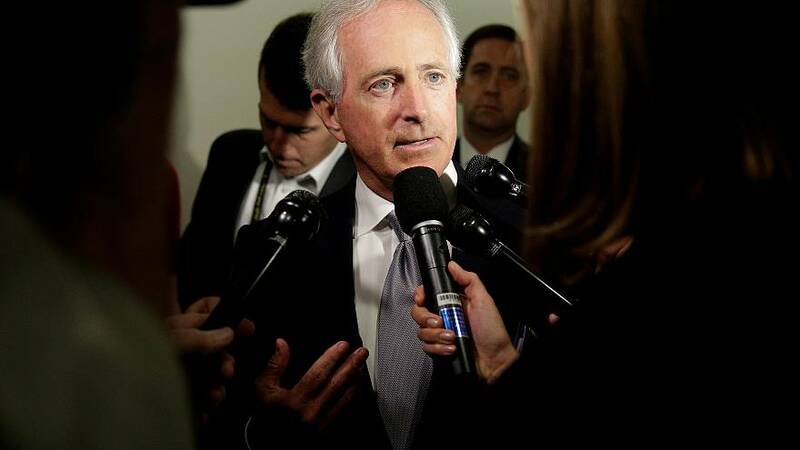 Although a foreign policy specialist, Corker is also a key player in the tax debate. His support could be crucial as Republicans seek passage of the White House-backed tax plan in the closely divided Senate. The latest exchange between the two Republicans was triggered by Trump on Twitter where he wrote that he anticipated opposition from Corker for his administration’s tax reform plan. With the tax plan, Trump is hoping to notch up his first major legislative win – something that has so far eluded him even though Republicans control the White House and both chambers of Congress. The exchange of insults between the president and Bob Corker, leading fiscal hawk and the head of the Senate Foreign Relations Committee, overshadowed Mr Trumps talks with Republican senators to try to build consensus for proposed tax cuts. Trump has asked his fellow Republicans who control Congress to pass a package of tax cuts, including a deep reduction in the corporate income tax, by year’s end. Alienating any members of his own party could be costly for Trump’s legislative initiatives in the Senate because Republicans control the chamber by just a slim 52-48 margin. House of Representatives Speaker Paul Ryan urged reporters to ignore the Trump-Corker spat and concentrate on the tax plan. Securing congressional passage of his tax plan is critically important to Trump, who has yet to get major legislation through Congress since taking office in January, including a healthcare overhaul he promised as a candidate last year. Tax cuts were another of Trump’s campaign pledges. The White House argues that tax cuts are needed to boost economic growth and create jobs, but has shown sensitivity in recent weeks to arguments that it is endangering America’s long-term fiscal health. Democrats have painted Trump’s plan, with its $6 trillion in tax cuts, as a gift to the rich and corporate America that would balloon the federal deficit.